WORLDWIDE: Sector adapting to higher power outputs and changing grid demands. ZF Wind Power currently leads the geared offshore wind segment by supplying dedicated differential-type medium-speed planetary gearboxes for both the initial 8MW V164 and the latest 9.5MW upgrade. Its differential-type gearboxes differ from conventional planetary designs through the incorporation of torque-splitting technology for the low-speed gear stage, a solution developed and patented by ZF. 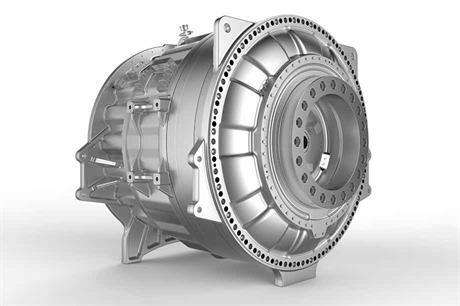 By reapplying this novel drive technology principle in the V164-9.5MW, the designers succeeded in achieving 19% rated input torque increase — from 8,000kNm to 9,500kNm — but with unchanged gearbox mass and outer dimensions. Several factors served as key enablers in the incremental evolution of the gearbox. One was optimisation of the original structural topology through advanced finite elements analysis (FEA). Second was the introduction of integrated taper roller bearings with optimised roller macroand micro-geometry for increased torque density of the planet bearings. Further attention was given to optimised load distribution on the gear meshes, and load sharing on the planets according to field measurement. A final measure was the optimising of gearbox auxiliaries and flanges by means of component testing.